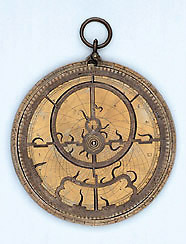 The most significant feature of this astrolabe is its use of a universal projection which was developed by az-Zarqellu in Toledo in the 11th century. The projection was used on instruments made in the Islamic tradition, and known in medieval Christian Europe as 'saph?a arzachelis'. It is described in various manuscripts, but was little used until it was revived in the 16th century by Gemma Frisius as his 'astrolabum catholicum'. It was then used on many Flemish astrolabes in particular. On the inside of the mater of this instrument is one of the very few examples of the use of this projection on a non-Islamic astrolabe prior to its re-introduction by Gemma.